The other day I did an interview about my internship for InteRDom and one of the questions I was asked was “What makes the DR unique?” Having been to many places (in North America, Central America, Europe, Africa and Asia), I thought I was well equipped to answer the question, but the more I think about the more I realize it is a very difficult question. Yesterday, “mi suegra” (useful Spanish word for significant other’s mother) and I were talking about food and she started talking about Russian salad. Russian salads are common here. You can get them at the “Chinese” restaurant to go with your plantains and wontons, they are traditional around Christmas, at buffets, and large events like pot-lucks. But, I have yet to encounter any Russians here. This got me thinking about culture and the nuances of culture. I would have never imagined Russian salads to be a traditional food in the Caribbean, but we live in a globalized world. Russian salad has become a part of the Dominican culture. We often limit culture with our stereotypes – the Dominican Republic culture is vibrant and colorful – filled with dancing and coconuts, rum and beaches. They love family and fun, and time is a fluid concept – often now is more important than later (in less politically correct terms, people are always late). US culture is fast paced – filled with fast food and fast schedules and peanut butter. Customer service is good. It is work oriented and independent (in less politically correct terms, people are self centered). Sometimes I find we get so caught up in judging differences that we don’t recognize our shared values as people. For example, in the US we may judge the Caribbean culture for apparently being less work oriented – maybe we wonder “don’t they want to keep climbing the ladder to make a better life for their families?” But here, in the DR, someone might wonder “everyone spends too much time at work in the US, aren’t they neglecting their families?” Both people are trying to care for their families – a core value common to all people. So, the answer to the question of what makes the DR unique is this: expressions. Here, people more often express their love in plantains more than peanut butter and jelly, people usually choose to dance salsa instead of swing, people often care for people in time rather than material, and kindness is to care about people’s lives not to keep a professional distance. It is a vibrant and fun. These differences are good, they make the world colorful, fun to discover and they teach us a lot. Let me quickly say what I am not saying here. I am not saying we need to move from one end of a spectrum to another. If we tend to disregard immediately differences as bad I am not advocating for immediately accepting them as good. We need to take a balanced approach and be aware of our cultural biases as we critically consider other cultures. Judging things is okay – in fact it is a critical and necessary survival skill that we employ everyday (I shouldn’t walk alone here at night, I should talk to this person about this matter, I’ll ask the cop for directions, not the drunk etc. ); the problem is blindly judging. At the end of the day, there are two points that have been reinforced for me here. First, we need to look below the surface. Often we find common values underlie the superficial actions. For example, the young American woman with her baby in the DR might be criticized for taking the child out in the midday heat, but the young Dominican woman in the US would be criticized for taking her child out late after then sun has set and the heat has died down. Culture is more nuanced than we realize, and sweeping judgments of people and cultures are dangerous assumptions. Secondly, we need to appreciate other cultures and not fear them. We live in a globalized world today and we can either embrace and benefit from it like Dominicans have embraced and benefited from Russian salad, or we can reject them entirely and miss out on many potentially enriching lessons and benefits. In 1926, Ruyard Kippling wrote this poem. I think it still applies today. Do you have any “we’s and they’s”? I know I have some. Sometimes I can think I’m immune to making negative cultural judgments or assumptions because I have traveled a lot or because most of my friends are international. How naïve of me! I often find myself thinking that I have better ideas, or ways – not only culturally but also personally. I rewrote two stanzas here that could apply to me. Think we’re wrong in the head? We keep our schedules tight. Your homework: Write your stanzas. 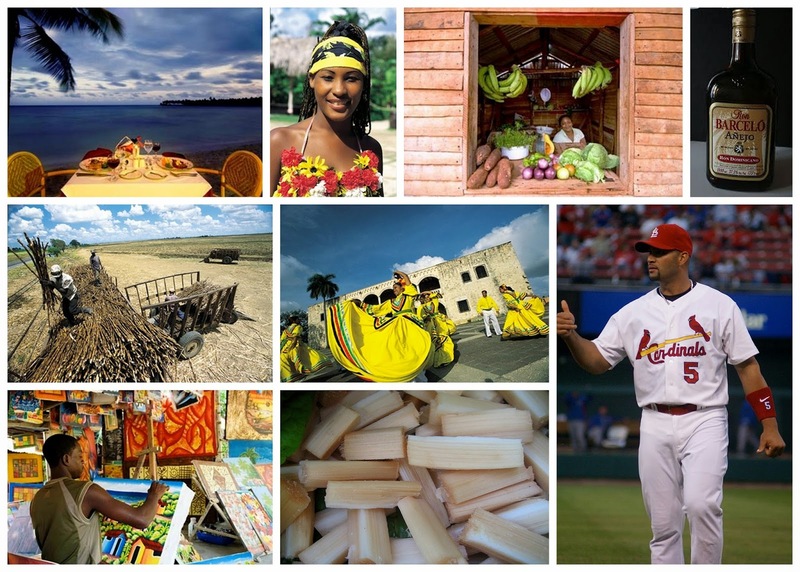 Here are two cultural collages I put together of things that people who are foreigners may think about of US and Dominican cultures. Just a visual aid to think about cultures, perceptions. Chances are if you are American you don’t own a hummer, always eat bacon and McDonalds and likely don’t ride in rodeos, but I bet you have had Thanksgiving dinner and watched a football game. Similarly most Dominicans don’t go to traditional dance shows for their entertainment or decorate their house with these street paintings, but I bet most have seen a baseball game and have had sugarcane juice. I hope you find this discussion on culture interesting as I did. Remember to think critically and appreciate both your own culture and others.